Steward’s Holy Family Hospital in Haverhill and Saint Anne’s Hospital are the only two general hospitals in Massachusetts to earn this year’s Top Hospital designations. 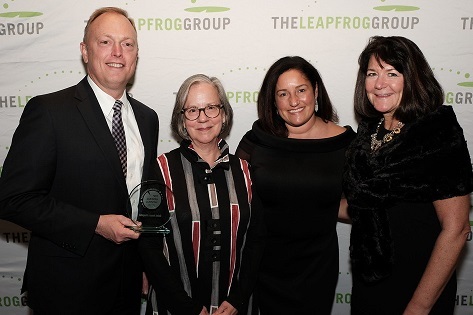 “We are gratified to be recognized by the Leapfrog Group as one of just six percent of America’s top hospitals in achieving important goals in quality of care and patient safety,” said Michael Bushell, president of Saint Anne’s. Photo: Accepting our award from Cristie Travis, CEO of the Memphis Business Group on Health and vice chair of The Leapfrog Group Board of Directors (second from left) at a presentation in Washington, DC, was our team from Saint Anne's: (left-right) Michael Bushell, president; Donna Leger, associate chief nursing officer; and Carole Billington, chief operating officer and chief nursing officer.